One of the most fascinating aspects of the arid intermountain regions of the American West is the ever changing scenery. The heat and lack of water test the limits of plant and animal life. The result is that minute topographical or climate changes can alter the local environment completely. 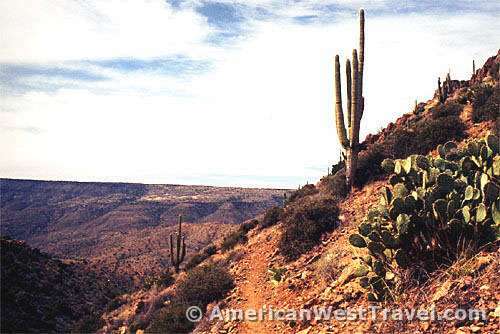 The Seven Springs area of the Tonto National Forest, just north of Scottsdale, Arizona, offers hiking trails in the 3,000 to 4,000 feet elevation range. 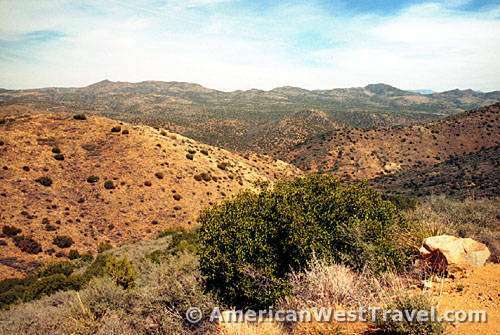 As you walk up and down the hillsides, the terrain varies from cacti to juniper, pinyon, and grasses. The saguaros which enjoy well-drained hillsides start to give out above 3,000 feet. In the transition zone, there can be combinations. 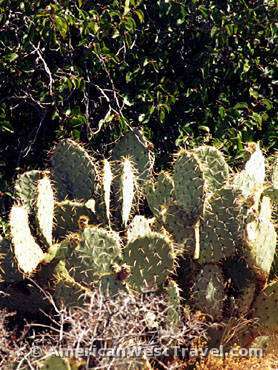 Prickly pear cacti will appear at higher elevations on sunny, dry slopes. In fact this versatile cacti grows in many parts of the country on dry slopes. The three photos below were taken around 3,700 feet, all in close proximity. 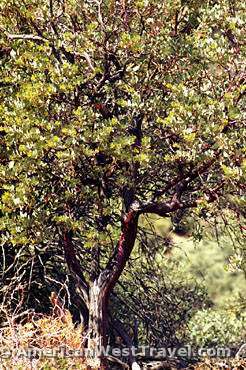 At left is a mountain mahogany tree, often found in dry mountain areas at mid-range elevations. The enlargement clearly shows the distinctive reddish brown wood. 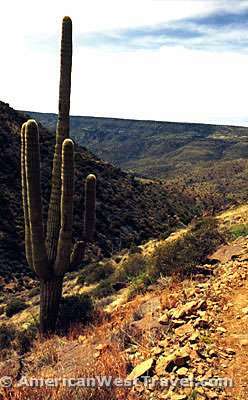 At center is a flowering desert broom, a tree similar to the paloverde. 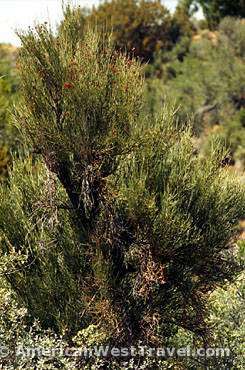 It is often found at lower elevations on dry desert slopes. At right, the ubiquitous prickly pear. The final part of our loop hike sampled a stretch of Cave Creek Canyon. 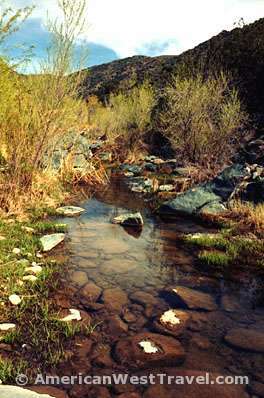 Cave Creek is a perennial stream (flows year-round) and offers a riparian environment completely different from the open desert or even dry desert washes. 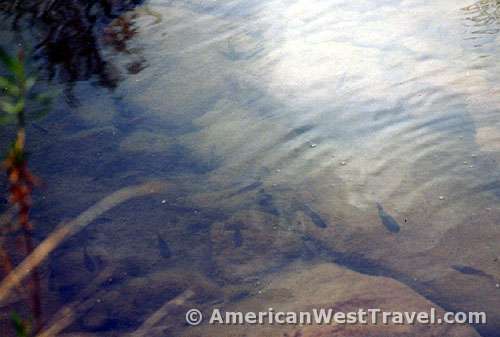 The stream even has a population of native fish including minnow, sunfish, and dace. 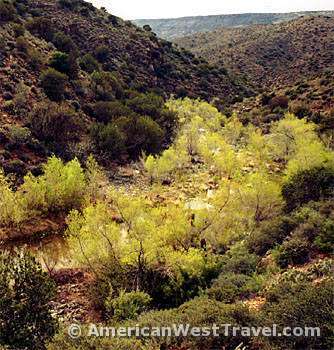 The riparian area of the stream can include trees not normally associated with the desert. Cave Creek contains cottonwoods, willow, ash, hackberry. and even giant sycamores. The photo left shows a grove of budding cottonwoods. The area does get below freezing at night in the winter, and the deciduous cottonwoods lose their leaves and go dormant. 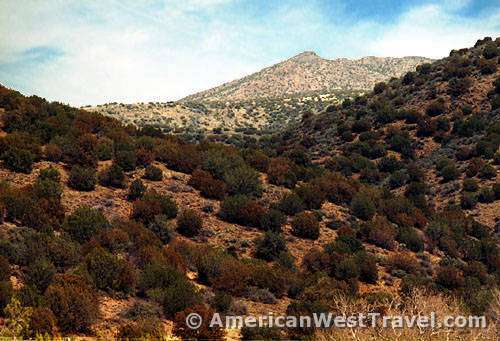 Note how narrow the riparian life zone is; the scrub desert plants resume right at the base of the slopes. Shown right is a rare "cristate" saguaro. It's a result of a rare genetic condition which occurs when the plant's main growing tip has sustained an injury or disease. 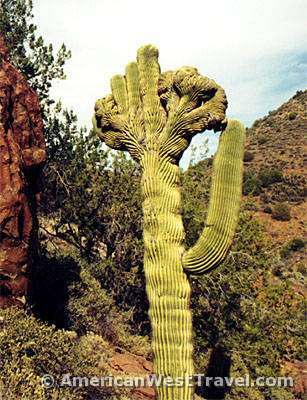 Instead of putting out normal arms, the saguaro puts out stubby, mutilated arms which often resemble a crown, hence "cristate", or crested.